I love this song! I love this video! I have no freakin’ clue what the guy is singing, but just listen! And look! 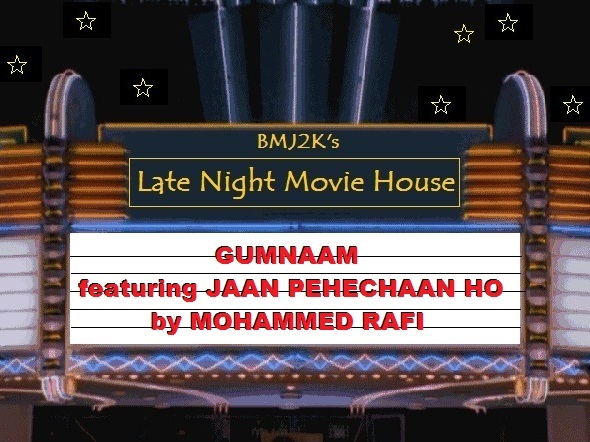 That’s Jaan Pehechaan Ho by Mohammed Rafi from the movie Gumnaam back in 1966. They made a Heinekin commercial out of this song but this is better. I want to go to this club! I want to go back to 1966 put on a cat mask, a frilly shirt and a Patrick McGoohan jacket and dig the scene, man. Plus I think there were a ton of drugs being done there too. This is from a movie that probably none of us has seen but thanks to Heineken we are bombarded with that song 24/7. Problem is, the video in the commercial is nowhere as interesting as the real deal. OK, the magician is cool. UPDATE: After some research, I realized that I am not giving Ted Lyons and his Cubs the credit they deserve. They rock! The Rafi song that got the most widespread attention worldwide was jaan pehchaan ho, thanks to Ghost World and this new commercial. But this was not the best of Md. Rafi. He had such a great voice that every song he touched became a legend. More of this singer should come to the world. If u like Jaan Pehchaan Ho, you will love Aaja Aaja Main Hoon, Tumne Mujhe Dekha, Yeh Chand Sa Roshan, Aa Ja Re Aa Zara and Chand Mera Dil … All by Rafi. Available on youtube. He was/is the most worshiped singer in India. I’ve heard some (not too much) of his other music and I like it but I have read what others say and there is a massive amount of respect for him out there. Yes, Indeed, there is a huge ammount of respect for him. Great to know that people like his voice outside of South East Asia too. I love the way he used to research with his voice. He was such a great person by heart and being a muslim, he had no problem in singing Hindu prayers and that too with true devotion. These type of singers, they are hard to find…..